Copyright | General Policies of this Site Check out our new edition of Christopher Marlowe, as well as our plans for a Roman Perseus and for library of Shakespeare's sources and other Renaissance materials. newly named site of the 2004 Summer Olympic Games! Many are the sights to be seen in Greece, and many are the wonders to be heard; but on nothing does Heaven bestow more care than on the Eleusinian rites and the Olympic games. Using the Perseus architecture catalog, Nicolas Stringos built a 1 cm:1.1 m scale model of the Parthenon on the Athenian Acropolis. Good work! Take a look at Nicolas' Parthenon model. 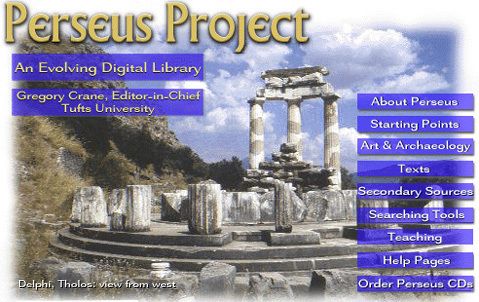 The Perseus Project is supported by the Annenberg/CPB Project, the National Science Foundation, Apple Computer and the National Endowment for the Arts, the National Endowment for the Humanities, the Packard Humanities Institute, the Getty Grant program, Xerox Corporation, Boston University, Harvard University, and the Fund to Improve Post-Secondary Education. Perseus is a non-profit enterprise, located in the Classics Department, Tufts University.